If a bird in the hand is worth two in the bush, as an old saying goes, then this Tree in Hand is worth ten in the ground, growing and nourishing the world around them. The message is clear but quietly under-stated, even as it emphasises the relationship between man and tree. 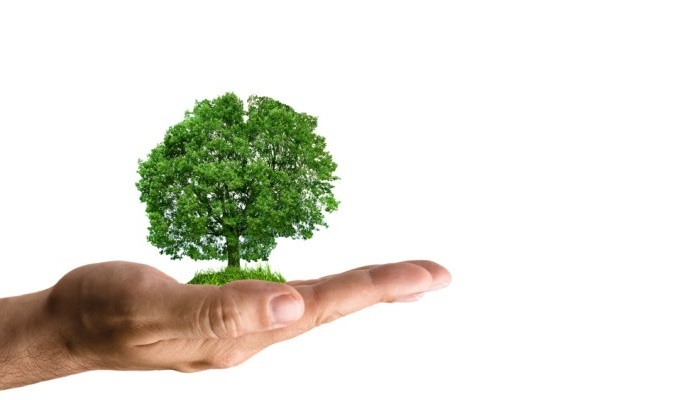 A man holds the fate of a tree in his hand – or hands – and his actions or lack of them can mean life or death to the tree and ultimately to all the life in a forest or on a planet. Serious business, and serious business people who choose to send corporate holiday ecards can make a powerful statement with this card and others like it. As a reminder of your company's goals and ideals, the holiday ecard also demonstrates the need for others like your business associates and clients to turn a hand and join in the ongoing efforts to conserve and care for nature's bounty of trees. The tree in hand is certainly not a Christmas tree but rather the leafy kind that wears a nest of robins in its hair. Add your logo, your own personalised greeting and other information or suggestions if you wish; the Tree in Hand corporate Christmas ecards can also speak for itself quite effectively.